Pulling eye Pre-Terminated cables can be manufactured to suit your individual project requirements. A Pulling Eye can be factory installed. Fibers are terminated with swivel pulling eyes to eliminate cable damage during installation. The Fiber cabling assemblies can be ordered in either indoor (plenum) or outdoor versions, and in 4, 6, 12 or 24 strand fiber counts, and in multimode OM1, OM2, OM3 and OM4 or Singlemode. Volition fiber patch cable (VF45) assemblies are ideal for panel-to-panel cross-connects, equipment back planes, under desk and other applications that require reliability and mechanical strength. 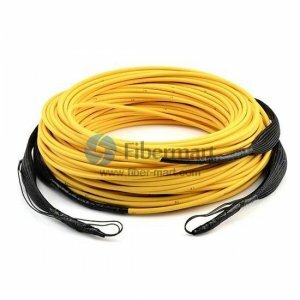 GPP Fiber Optic Patch Cords have a tight, 3/8 inch bend radius, which makes them easier to route and manage.